Cauleen Smith. Processional Declaration, 2015. Courtesy of the artist and Corbett vs. Dempsey, Chicago. How – right now, today – can we care for U.S. everyday social life? This exhibition combines two areas of recent work by filmmaker Cauleen Smith. For the show, Smith created a film from her research on the influence of the music and life of Alice Coltrane (1937-2007), a film visually keyed to a recording of a notable Coltrane composition. PILGRIM, 2017, joins three pieces drawn from an area of Smith's work best described as activist response, a multiplicity of work rooted in Chicago, where Smith has lived since 2011. These works differ in their effects, taking on the locations (public, the street, the worldwide web) and functions of activism (being loud, using your body, making informal networks for self-education and information dissemination). These include LESSONS IN SEMAPHORE (2013), a digitized 16mm film and HUMAN_3.0 READING LIST (2016), an iPhone film of Smith’s essential readings as drawings. 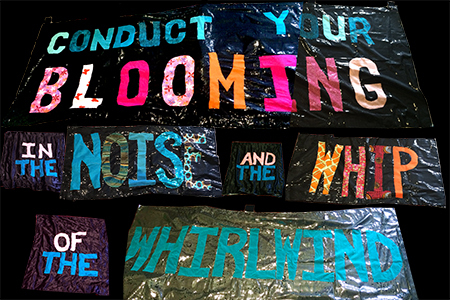 Smith's GWENDOLYN BROOKS BANNERS for The Black Love Procession: Conduct Your Blooming (2016) took a part of a poem by Gwendolyn Brooks and mobilized it as a renegade procession that took place in Bronzeville, a historically black neighborhood. This procession responded to a controversial exhibition by an artist whose work about the death of Michael Brown was presented at a gallery in Bronzeville. Smith was awarded the 2016 Alpert Award in visual art and was the first recipient of The Ellsworth Kelly Award from the Foundation for Contemporary Arts, given to the artist for Give It Or Leave It, a solo exhibition linked to The Warplands through research and a book. Give It Or Leave It is forthcoming at the Institute of Contemporary Art, University of Pennsylvania in 2018.